Nail Fungus or Onychomycosis – a very common condition that occurs either in fingernails or toenails. Inflammation, crumbling, thickening, yellowing of the nail are few symptoms of nail fungus. The main culprit behind the trigger of nail fungus is a moist environment. Apart from that weak immune system, abnormal pH levels, poor hygiene and diabetes can also develop a nail fungus. Due to moisture or any other reasons when fungus thrives in toenail then toenail fungus is developed. When mold or yeast develops in fingernails then it is called fingernail fungus. If the nail fungus is left untreated, it may lead to cracking and even loss of the nail. Nail fungus is not contagious but it is better not to share the footwear or gloves with others. Oral antifungal pills or medicated nail polish or remover are generally prescribed for nail fungus. But simple home remedies like baking soda or oregano oil can provide better and effective results than medical treatments. Note: To help this article read a little faster, we use the abbreviation (OO) for Oregano Oil throughout the article. 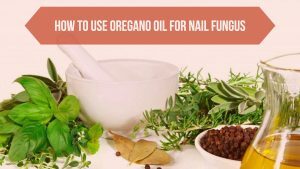 Is Oregano Oil Good For Nail Fungus? Oregano oil contains antibacterial, antiparasitic, antiseptic, analgesic and antifungal properties which make it an amazing remedy to remove the nail fungus. The compound carvacrol is the main reason behind the fungicidal properties of oregano oil. When taken internally, it can fight off the candida virus within the body. How to Use Oregano Oil for Toenail Fungus? There are different ways to use oregano oil for foot fungus, foot meaning fungus in between the toes (like athlete’s foot) and fungus on the toenail. We are presenting a detail description of them below. Choose any of them as per your interest and try it regularly to get relief from the fungus infection. The following methods work for both toenail fungus and fingernail fungus. OO can be applied topically and taken internally as well to control and reduce the nail fungus. If you don’t like the taste of OO, you can avoid internal consumption of OO. Or else you can try both internal consumption and topical application. Take few drops of OO and gently rub it over the affected area of the nail and its surrounding areas. Let it stay until it is completely absorbed. Consume few drops of OO daily either diluting it with water or fruit juice. If you don’t like the taste of it, you take OO in supplements form as well. Dilute 2 – 3 drops of OO into a teaspoon of olive oil. Apply the mixture on the affected part of the nail. Rinse off with water and pat dry your toes completely. As both OO and tea tree oil also contains antibacterial and an antifungal property, this process provides relief from nail fungus more effectively. Combine 3 drops of OO and 2 drops of tea tree oil. Apply the mixture on the affected area and surrounding parts of the nail. Let it stay for more than 30 minutes. Rinse off with water and pat dry the toes completely. The lauric acid present in coconut oil contains antifungal and antibacterial properties. The nutrients in it strengthen then nail the cuticles which prevent the fungus from spreading. Combine 5 parts of coconut oil and 1 part of OO. Clean the affected area, pat dry and trim the infected nail. Apply a small amount of the mixture on the infection. Note: If the application is causing burning sensation then reduce the amount of OO. Combine 2 tablespoons of coconut oil (melted), 10 drops each of OO, garlic oil, clove oil, peppermint oil and tea tree oil. Mix the ingredients well and apply it over the nails. Massage the mixture for few minutes and leave it to dry completely. Repeat the process 2 – 4 times a day. Are There Any Side Effects of Oil of Oregano for Toenail Fungus? Oregano oil should be applied in very small quantities. Undiluted application of oregano oil can cause irritation and redness of the skin. As oregano oil is very strong it is good to dilute it with any other carrier oil. If the direct application is not causing side effects then you can use it directly. Oral usage of essential oil doesn’t have any significant side effects. However, a higher dosage of oregano oil or supplements can cause upset stomach and worsen bleeding. Furthermore, some people can be allergic to the essential oil so they should avoid it. Pregnant and breastfeeding women should avoid oral consumption of oregano oil. Patch test before trying regular treatments. Trim the nails and clean the nails before applying the treatment on nail fungus. Dry your feet and hands completely after showering. Keep the nails always dry to prevent the formation of fungus. Cut the nails short regularly. Avoid wearing shoes as much as you can. Try using flip flops often. Wear cotton socks to the nails breathe. Wash your socks regularly with hot water and soap. Dust some fungal powder before wearing socks. Avoid walking bare foot in public places, moist and damp areas. Don’t share your footwear with others. Are you going to try oregano oil for treating your nail fungus then share your experience with us in the comments section below. For more articles, stay tuned with our website. Battling mild (yellow visible only in bright natural day light) both big toes fungus 2 yrs, my skin was yellow too but that has improved. I initially tried Oreganol daily for a month or two and it did not work and irritated skin; confused about carrier oil to penetrate nail, please cmoment on that. Tried Australian tea tree from Trader Joe with and without ccoconut carrier; dried surrounding skin and skin turned yellow like the nail and fungus remained. I tried soaking in vinegar everyday for a month and that seemed to make it worse. After that, podiatrist put me on Penlac; 9 months now and no improvement. Today I filed the top surface with the hopes that Penlac will get to the fungus; strong urine type odor from the filing of the nail. The nail is now thicker than before. Most recently apply Penlac in morning and coconut with tea tree at night. I am seeing intermittent yellowing of ffingernails on dominant hand. I told my doctor but he was not interested. Please help. I forgot to mention that I also take probiotics, caprylic acid and olive leaf extract to fight it from the inside. Thank you. Topical treatments are not working for you because the problem is inside. The right deal to remove fungus on toenails is usually making changes to your diet. Cut off the sugar from your diet as it can help the fungus to thrive. Introduce beneficial bacteria like probiotics into your food. Include more fiber, protein and nourishing fats in your diet. Drink vegetable juices as it can help to boost the immune system. Stay away from gluten, alcohol and smoking. Drink plenty of water to stay hydrated and flush out toxins.